Today is St. Stephen’s Day, the 26th of December. All I know about Stephen is that he was stoned to death for blasphemy—which seems an unlikely entry on the résumé for a saint. I’m sure at one point I must have known who did the stoning and what the blasphemy was, but it all escapes me now. It couldn’t have been very spectacular blaspheming, though, if they turned the day after Christmas into his feast day. St. Stephen’s day is the day on which the events described in the Christmas carol about Good King Wenceslas took place. You know the carol—Wenceslas sees a ‘poor man’ out in the snow ‘gathering winter fuel.’ He has a page gather some meat, some wine and some pine logs (why waste good hardwoods on a peasant?) and ‘forth they went together’ to make sure the peasant didn’t go to bed hungry that night. I’ve no evidence to support this, but I’d bet my paycheck (if I had a paycheck) that the page carried the food items and the peasant ended up toting the pine logs. Wenceslas might have carried the corkscrew. It wasn’t just a coincidence, by the way, that this happened on the Feast of Stephen (assuming, of course, the carol is based on an actual event—it’s not as if there’s anybody out there fact-checking Christmas carols). Christmas was the day set aside for exchanging gifts with equals; Stephen’s Day was for giving gifts to people who were below your social station. It’s the original re-gifting day. Although he may have been good, Wenceslas was never really a king. He was merely the Duke of Bohemia—which isn’t a bad gig in itself, but it’s hardly in the same league as king. It wasn’t until after he died that Otto, the Holy Roman Emperor, granted Wenceslas the honorary title of rex justus—a ‘righteous king.’ Like St. Stephen, Duke Wenceslas was also a martyr. He was murdered by his brother Boleslav as he returned home from church one day. Anybody who’s ever had an older brother—especially who can do no wrong—will understand the impulse. I suppose it could be said Wenceslas had the last laugh. After all, nobody ever wrote a carol about good king Boleslav. In fact, he is known in history as Boreslav the Cruel. I suppose murdering your brother is something of a disqualification when it comes to being selected as a subject for a Christmas carol. 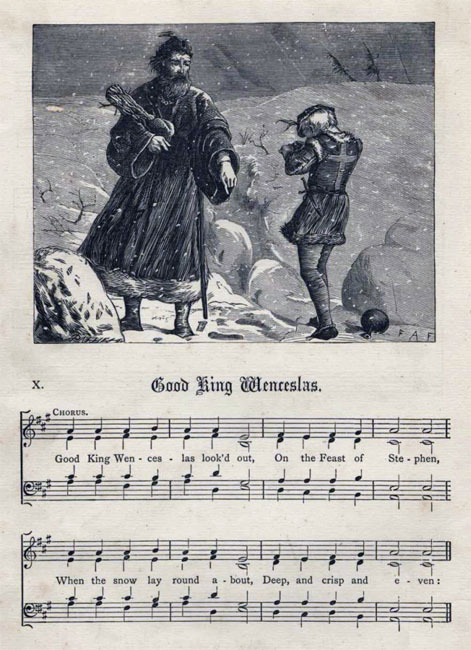 Still, my guess is that given a choice, Wenceslas would have preferred spending a few more years leading his page around Bohemia delivering foodstuffs to random peasants over having grubby school kids singing about him down the centuries during the holiday season.